I did it. I finally took the plunge and went to Soul Cycle. They would never deign to participate in something like ClassPass or FitReserve. But they do offer you your first class for $20. I just had to know what the original cult spin class was like. 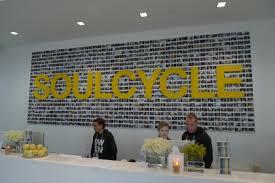 There are people for whom Soul Cycle is a religion. And indeed, there are church-like elements to the experience. Good music, candles at the altar, a person at a podium shouting their truth at you, devotees wearing special clothes, and we ended with our heads bowed and eyes closed. There are even those smiley door-greeting people told to find out if you’re a guest so they can make you feel welcome when you walk in the door. And they lure you in with those damn Grapefruit Jonathan Adler candles that smell so good you could burn your nose off by sticking it into the flame to get closer. I want to go back just to smell those things again. That would probably be the only reason I’d go back too. Not that I didn’t enjoy it. It was an amazing workout. I’m just not into cults. And that’s what Soul Cycle is. A trendy one, but a cult all the same. (See these magazine articles from Vanity Fair and NYMag if you don’t trust me on that.) They’ve done a great job of branding themselves and creating an A-list, dance club-like feel. You feel special while you’re in there. And truth be told, I liked the workout and the music (which is especially loud) better than FlyWheel. But that’s probably because I tend to like a non-metrics driven cycling class. That said, I’ll always go back to FlyWheel because they’re dependable, they have free water bottles and fruit, and I have to check my metrics sometimes. Whom am I kidding, if I had all the money in the world, I’d go back for more soul cycling (if they’d have me), not just for the candles but for those moments when I felt like I was flying. You can find soul-similar-style, non-metric rides though that aren’t quite as holy or holier-than-thou (in that they are on ClassPass) at Cyc, Crank, Monster, (and probably at Peloton’s Rhythm Rides which I haven’t tried yet). It is that rare workout where you’re transported to a trance-like zone between your body and the music so that you push harder without thinking about it; good amount of upper body work so you come close to a total body workout; nice amenities in the locker room; those grapefruit candles; the MUSIC; being part of the cool crowd.